I mutter to myself as I endure a blur of queasiness and bone-tiredness. When I was pregnant with my son 14 years ago, in addition to resting – a lot! – I found that constant ginger tea and regular protein snacks helped keep the relentless nausea at bay. And I also found refuge in a restorative yoga practice that gently supported my energy during this more delicate, first stage of pregnancy. Our Senior Bliss Baby Yoga Teacher and mother of two, Mari Notaris, agrees that expecially if a woman is suffering from ‘waves of nauesea’ restorative yoga should be the ‘go-to’. ‘In my experience there is not much else that she really needs at this stage. One of the most nurturing of all of the restorative yoga postures would be Supta Baddha Konasana (supported Bound Angle pose—see Posture 2 in Ana’s Sequence), or the Goddess pose (with legs straight and a blanket or bolster under knees—pictured),’ recommends Mari. 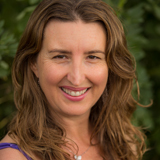 Another senior Bliss Baby Yoga Teacher, Emma Grant, is also a mother of two girls and she found that she managed the nausea in her two pregnancies by listening intuitively to what her body wanted and needed. “It may have been avoiding a certain food that felt too heavy for my digestion or to know when to rest,” explains Emma. “The practice of Yoga Nidra with a silk eye pillow was my daily ‘go-to’ and seemed to help the nausea or any other symptoms that arose, such as headaches or tiredness”. 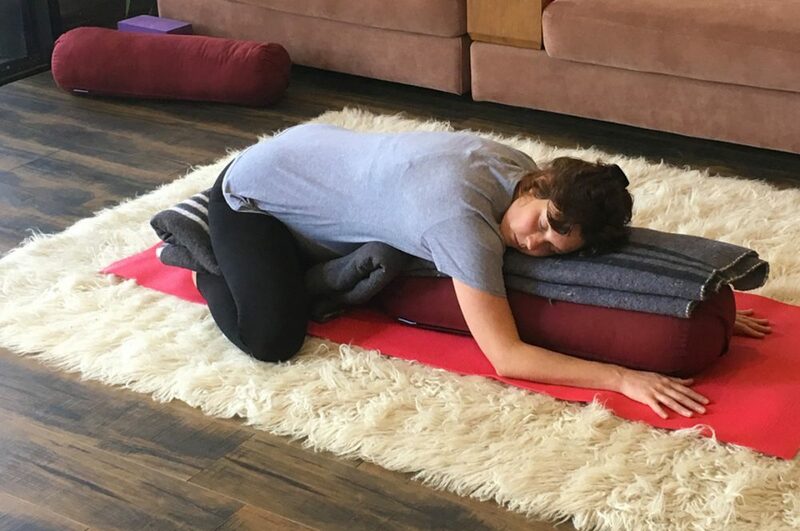 Click here to download my gentle, nourishing First Trimester Restorative Yoga practice, especially designed to rejuvenate, and stabilise nausea. Ana Davis is the director and founder of Bliss Baby Yoga, and is the lead teacher on our Online Prenatal and Postnatal Yoga Teacher Training Course and Online L1 Restorative Yoga Teacher Training Course. Ana is also the author of “Moving with the Moon – Nurturing Yoga, Movement and Meditation for Every Phase of your Menstrual Cycle and Beyond” – a complete guide to yoga for the menstrual cycle and menopause.